film after film of Edwardian rain. Rain as a haunting, rain’s ghost train. Friday was all kinds of wet. Sometime early in the predawn morning the skies opened up and the rains just kept on coming. I cancelled plans to meet friends for coffee and book shopping in the morning and instead we stayed at home. It was so overcast outside that the house was dark and cool even in the middle of the day. The rain never stopped, coming down hard and the easing off in turns; when it came down hard on the roof it blocked out all sound, a kind of white noise. The three of us spent the day eating toast and playing with lego. Both kids slept well, lulled perhaps by the sound of the water falling. S came home early from work and we had big bowls of pasta with leek and kale for dinner. T fell asleep in my arms on the couch and I watched a movie and drank a mouthful of red wine before crawling into a soft warm bed. There are worse ways to spend a rainy day. By Saturday the weather had cleared, and so I made this wonderful Szechuan Tofu dish for lunch. You wouldn’t guess that we eat tofu quite a lot; aside from this salad there are no tofu recipes on the blog. Truth be told, I’m not the most imaginative cook when it comes to tofu. Usually I just throw it into a stir fry along with a pile of veges for a quick weeknight dinner. 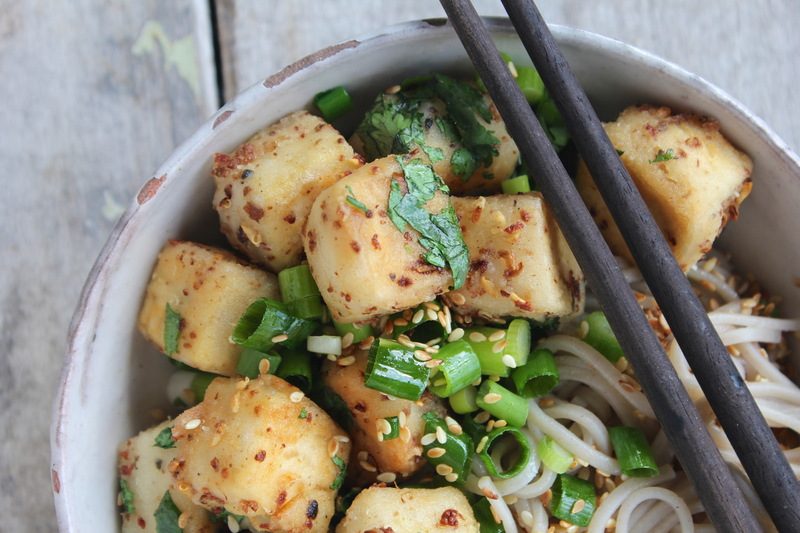 This szechuan-crusted tofu, though, is changing everything up in our household. A few years ago my friend (and housemate at the time) came back from a stint in China and she introduced me to szechuan pepper. It’s common in a lot of Chinese cuisine and although it’s known as a pepper it actually tastes quite different to black or white peppercorns. 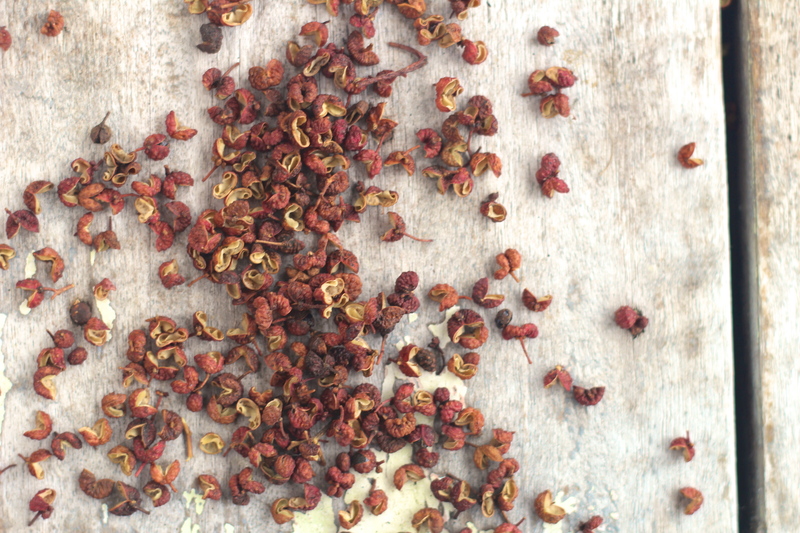 Szechuan pepper has a unique flavour with a hint of lemon overtones, and is really rather delicious. I’d forgotten all about it until coming across a bag recently, and although I’m yet to explore the many uses of szechuan pepper, so far I’m liking it very much. 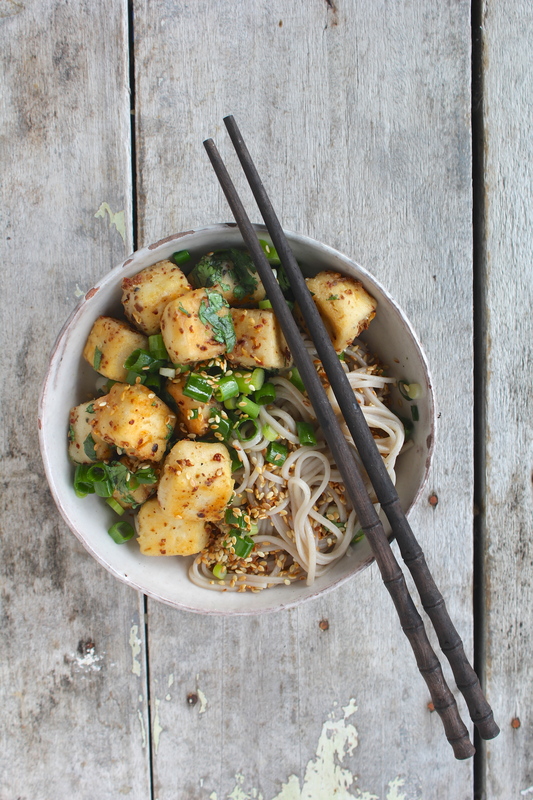 Since first making this Szechuan Tofu with Soba Noodles a few weeks ago, we’ve been devouring it on a regular basis. It’s such a simple dish and yet oh-so-tasty. The silken tofu contrasts wonderfully with the crispy coating, the noodles add a nutty base, and the greens brighten the whole lot up. Prep the veges by finely slicing the spring onions and roughly chopping the coriander. Dry toast the sesame seeds in a pan over a medium heat, tossing continually and removing from the heat once the seeds start to brown. Set aside. 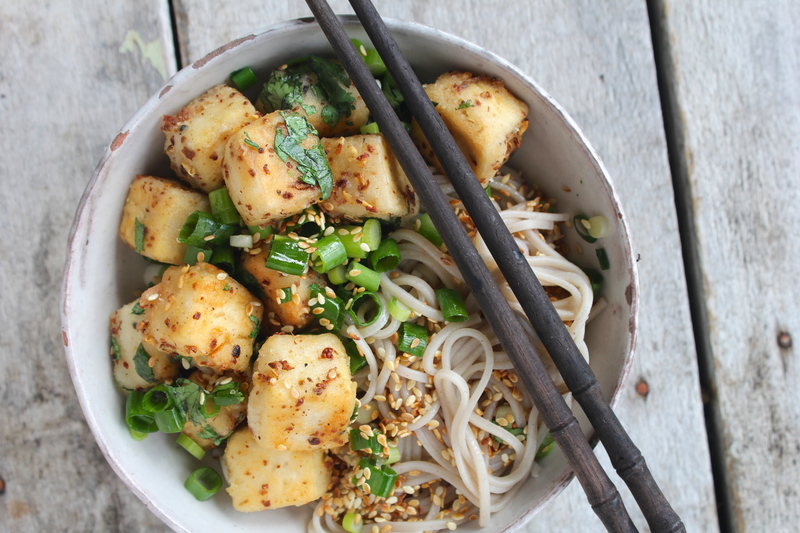 Combine the flour, arrowroot powder, and ground szechuan pepper in a wide shallow bowl. Cut the tofu into cubes (about the size of a small dice) and toss in the flour mixture until coated on all sides. Heat the sunflower oil in a shallow pan over a medium-high heat. 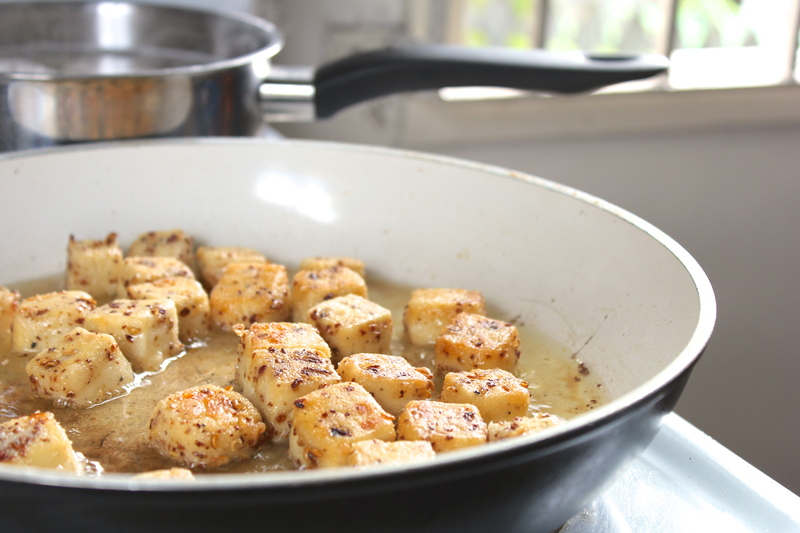 Once the oil is nice add the tofu cubes to the pan in a single layer. Cook for about 5 minutes on each side, or until the cubes are golden. 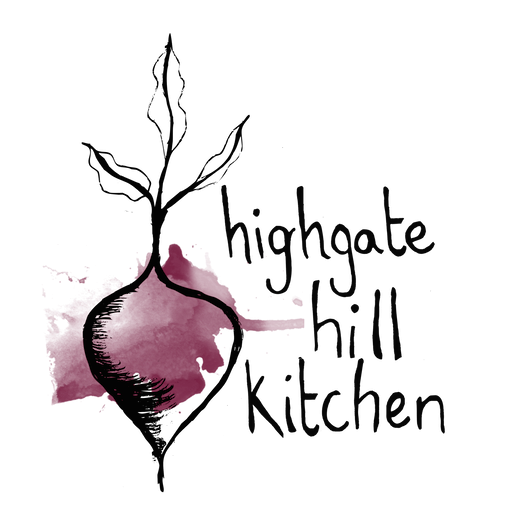 Remove from heat and toss together in a bowl with the spring onion and coriander. While the tofu is frying, boil a pot of water and cook soba noodles according to instructions (my tips for cooking soba noodles here). When everything is ready, drain the noodles and divide between two bowls, drizzling a splash of sesame oil over the noodles. 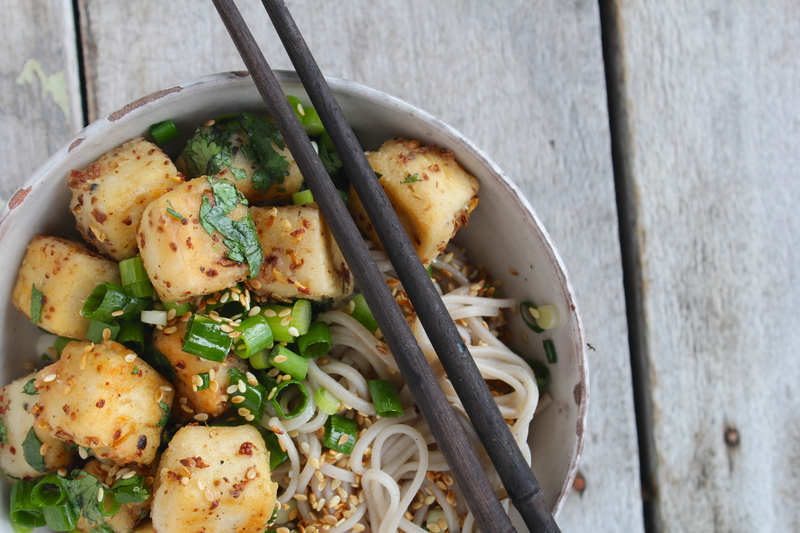 Top the noodles with the tofu mixture and sprinkle the toasted sesame seeds over the whole lot. Eat immediately. I am in love with the look of this dish! 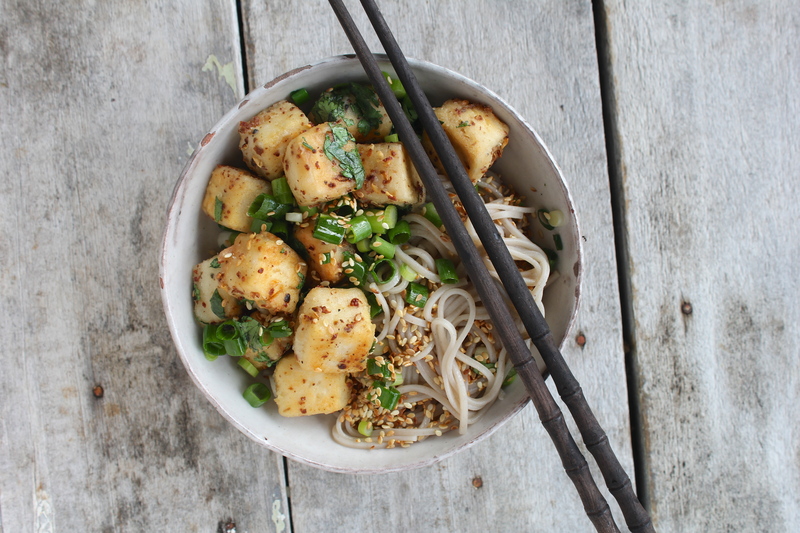 I am a huge fan of both tofu and soba – I had them both for dinner last night, in fact. Your tofu looks wonderfully golden and crispy on the outside, and I bet it is so flavorful from the szechuan pepper. I am hoping I can track some szechuan pepper down so that I can try this out soon! 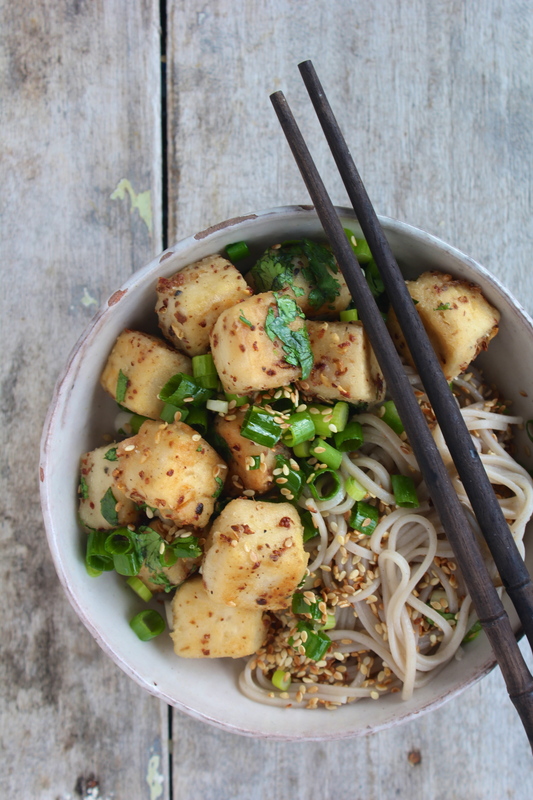 It is a delicious dish, but if you can’t find any szechuan pepper you might be able to find Chinese-five-spice, which is also wonderful with this tofu. Let me know how you go!